Little Mass is based in Los Angeles, California is a quality designer of boutique girls clothing, started by sisters Tina Chang and Hannah Yoo. Married with children they manage family and business obligations together. Tina designs the clothing while sister Hannah is the business manager. Their strong desire to build lasting relationships with customers make this glamorous and funky girls clothing line a perfect fit! Beginning with outstanding designs for women, the Little Mass brand is an extension of Mass Creation, Inc. founded in 1985. After years of succeeding with their line of popular women�s clothing, the company created their children�s division of Little Mass. They sought to bring the same quality and top runway styles in their Little Mass clothes. We know that they certainly succeeded. Starting in 1997, the designs from Little Mass quickly rose to a must have when Hollywood loved the look for their own littles. We feel great offering Little Mass and her sister brands (more on these in just a few minutes) to our customers because they continue to dress girls in designer threads and styling them as cool, happy and stylish. We love that the brand takes the latest trends and spins their own twists on them, setting the bar higher and sure to delight your trendy girl. Once the designs proved to be filled with value and a fresh style, the began to expand the Little Mass division. They started by designing the first collection of Le Pink special occasion dresses. These dresses are filled with fanciful tulle and beautiful decorations. Success follows all of their girls designer clothing lines, from the anchoring Little Mass, sparkling Le Pink to Tru Luv (the line for the sophisticated tween) and the latest expansion to trendy baby wear, Mini Mini. Their latest release of spring 2017 clothing is sure to remind her why Little Mass is one of her favorites. With creative perspectives on girls clothing, these outfits are ready to take on a fun-filled summer! When it comes to the warmer months, Little Mass designs are often filled with lighter fabrics, floral prints, and flowing fits. She is sure to appreciate staying cool in the heat without sacrificing her style. We love the hanky hemlines, touches of lace the imaginative looks and decorations that are out of her daydream fantasies. Looking to purchase an outfit she will adore? Look for the new Little Mass Puppy Top and Shorts. Currently on pre order, this design is expected to arrive towards the end of February. The top features a fluffy puppy and a sparkling rainbow! This follows the wacky trend set by silly YouTube videos we are sure she loves. 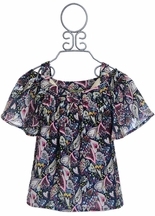 We know that every girly girl loves her floral prints for spring, and Little Mass is here to fit that bill! 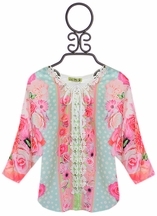 The gorgeous pink flowers are found on a casual summer dress and on a trendy romper. We love that these small blooms match the gardens and are found on a fabric that stays cool in the heat. Let�s spend a few moments discussing the sister brands that are part of the Little Mass company. 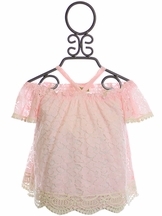 We love that Le Pink is filled with fun special occasion dresses that your daughter can wear to her birthday, for Easter, holiday parties and more! These dresses jump out of a photograph and are perfect for any family portraits! We know that Little Mass is ready for summer play and back to school, and when we want a special dress for any event, we look at Le Pink. The same quality and styles filled with glitz and glam, what more could you want?